Night Guards are the optimum choice for treating disorders of the TMJ. TMJ (temporomandibular joint) disorders involve the jaw joint are known to cause a myriad of problems. If you have symptoms such as pain or a “clicking” sound when eating or opening and closing your mouth, it is often because the jaw joint and the muscles necessary for chewing are not working correctly. There are many causes of TMJ disorders. Clenching and grinding of the teeth are most common and are often the result of a misaligned bite. Damage to the jaw joint after injury and disease such as arthritis may damage the joint or tear the muscles and ligaments. The disk inside the joint which acts as a “cushion” may slip out of position for any number of reasons as well. TMJ disorders are treated with a night guard. Worn at night, this dental appliance positions the jaw in a way that reduces stress on the muscles of the face and neck and protects the enamel surface of the teeth when TMH disorders include clenching and grinding of the teeth. Do you grinding or clenching your teeth? Do you stiff muscles around your jaws? Do you suffer from frequent headaches and pains in your neck? Do you hear clicking or popping when you open your mouth? Is it hard or painful to open your mouth wide when you eat or yawn? Have you suffered an injury to your neck, head, or jaws? Do you have arthritis in other joints? Have you noticed your teeth no longer touch when you bite? There are many treatment options available at Parkview Dental to treat TMJ Disorders. Dr. Struan Vaughan and Dr. Earl Pierson will complete a detailed evaluation to diagnosis the possibility of a TMJ disorder and to determine the best course of treatment for your situation. Our goal is to relieve joint pain and muscle spasms. Night guards are often recommended to help stop clenching and/or grinding of the teeth which reduces muscle tension while protecting the cartilage inside the joint and the enamel surface of the teeth. Night guards position your jaw forward to relive pressure on the jaw. 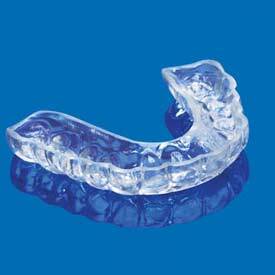 Night guards may be worn initially over 8 hours each day to help your jaw heal, transitioning to only while sleeping. To learn more about our Brooks Night Guards, please contact Parkview Dental Today!